I think it's a bit amusing that I have snails on my skirt and a hare on my bag. Both animals symbolize opposites, as one represents slowly plodding along, while the other represents speed. (Although I had a pet rabbit who wasn't very fast, but what she lacked in speed she made up for in cuteness and personality!) Anyway, getting back to things either falling into the category of fast or slow, why is it that summer vacation passes by at the speed of light, but when you're working things tend to slow down to a snail's crawl? It seems like only a few weeks ago I was getting out of school and planning for all of the fun things I would do this summer. Now, summer is almost over, the school year is approaching, and I am pretty sure time is going to slow down to a snail's pace. I bought this Anthropologie swirled snail skirt with my Anthro birthday discount featuring a whopping 15% off, but I shouldn't complain or say this sarcastically because every penny counts. Plus, the 15% off did cover a little bit more than the sales tax and, to Anthropologie's credit, it did get me to go to my local Antrhopologie store and pick a few things out. My husband joked that I should have worn this skirt to our favorite French restaurant where he orders escargot, but instead I opted for a park, where I thought the snails might feel much more at home. So here I am in the park, snails and hare in tow, enjoying the last few days of summer. In some ways, time really does fly by, even when you're working, and especially when you're busy. I think the important thing is to savor any and every moment, be it moments that go by fast or slow. That skirt is darling! The blue and yellow combo is so pretty! Thank you Jill! I adore blue and yellow together. I hope you're having a great weekend! OMG you buy the most amazing skirts! This is soo unusual, it's fabulous. Love the bright yellow with it and that necklace - wow! And the silver sandals are so cute. I think I seriously have a skirt addiction! I've probably loved collecting quirky skirts since I was in college! Yes, I agree that the variation of color with the ombre gradation makes the skirt very unique. I certainly have been enjoying my time off, but I am sad that it's now coming to an end this weekend! I am also a big fan of animals on prints be it dogs, birds or in this case snails! Thank you for letting me know about your link up! 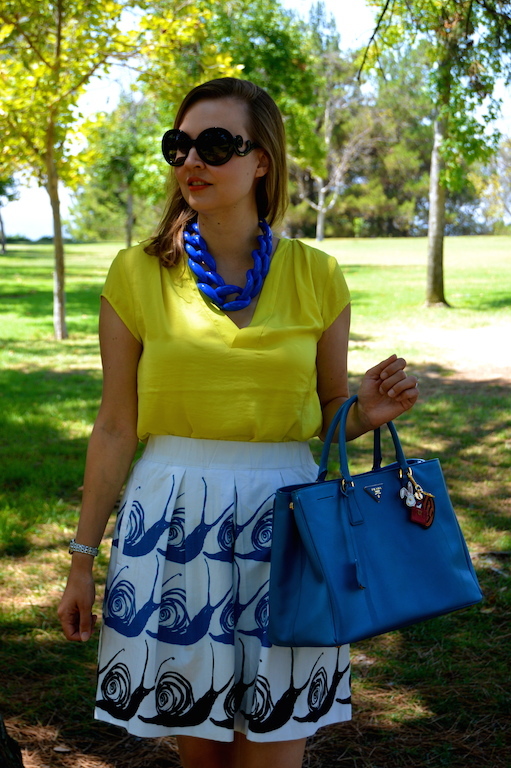 Just love the blue and yellow colors together in this outfit and what a cute skirt- the snail pattern is so fun! Thank you Carrie! I agree that the color combo combined with the snail pattern makes it a very fun skirt. Wonderful skirt and chain necklace! That snail skirt is super duper adorable OMG. And that teal bag is perfect with it. I love the hanging accessory on the bag, also. Thank you Ada! Yes, I fell in love with this skirt as soon as I saw the print! I hope you're having a great weekend! I love that we're both California girls, teachers, and style bloggers! And yes my goodness, summer flew by at warp speed! Adorable look, as always, Katie! Yes, it's fun to meet people in the same profession or who live in the same location through blogging. I am so grateful for the time we have off as teachers, but it really does fly! Thanks as always for hosting! I love everything about this outfit from the colors to the fun pattern of the skirt.Enjoy the last few days of your of your summer! I adore everything in this outfit. I like how you matched the blue necklace, bag and skirt so nicely together. Beautiful!! That skirt is super cute! The color combo is great too! Beautiful look - yellow and blue are the perfect bright and sunny duo!